What is a job title? A job title is a term that describes in a few words or less the position held by an employee. 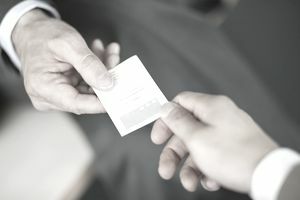 Depending on the job, a job title can describe the level of the position or the responsibilities of the person holding the position. Here’s information on what is included in a job title, and how you can use a job title in your job search. Also, see lists of job titles and job descriptions organized by industry and level of experience. A job title can describe the responsibilities of the position, the level of the job, or both. For example, job titles that include the terms: executive, manager, director, chief, supervisor, etc. are typically used for management jobs. Other job titles reflect what the person does on the job, e.g., chef, accountant, housekeeper, social media specialist, programmer, guest services coordinator, mechanic, etc. Some job titles reveal both the job level and the job responsibilities, such as head chef, lead accountant, electrical superintendent, marketing manager, etc. Employers use job titles to categorize positions in their organization. A company's organization chart will show all the positions in the company, listed by job title, the reporting structure, and company management. Employers also use job titles as part of their compensation management system. Certain job titles can be tied to pay grades. There may be a salary range for new employees coming on board, and for what current employees can expect to earn in a specific position. Job titles are also used to determine a career path at a company, both by employees eligible for promotion and by employers who are evaluating candidates for employment. There is typically a stepped progression from entry-level positions for new hires to senior staff or management roles for employees who have progressed with the company. When employers post jobs, the job posting will include a job title. That makes it easy for the company to track candidates, and for applicants to apply for relevant positions. When you're job hunting, you can search using your current job title or the title of the jobs you're interested in as keywords. Using keywords to job search will help refine your search to quickly find jobs that are a match. You can use job titles to narrow down jobs you’re interested in based on responsibilities and/or job level. Use variations of the job title you're interested in to see a broad selection of open positions. Most job sites have advanced search options you can use to drill down and expedite your job search. It is also important to use appropriate job titles on your resume. This gives the person reviewing your application a quick overview of your previous employment, so be as specific as possible. Do be sure what you list on your resume matches your LinkedIn profile, and lines up with what your previous employers will say, when your references are checked. For employees, lists of job titles will enable you to discover what other types of jobs you could be doing both at your organization and at other employers. They show you positions you can aspire to as you move up the career ladder, as well as jobs you can qualify for if you’re seeking a career change. Use the job title lists below to help you get a sense of what positions are available in career fields that interest you. Look at job titles for occupations of interest to see what types of jobs might be a good fit for your background. The world of business includes many job titles and a number of them refer to specialty areas within the business arena. For instance, an accountant could work for himself and provide services to individuals. In this role, he might simply have the title of a CPA. He might also work for a corporation where he takes on the title of chief financial officer, director of financial operations or bookkeeper. Many jobs require a creative spirit and industries like advertising are filled with these positions. Some of these jobs cater to the business market while others, like the media, work with the public in mind. Quite often, a career in a creative field can open up your prospects for a greater variety of job options. The skills needed are often interlinked and the experience you gain at one position can be useful in another. There are also jobs that are designed to provide a service to the public. Most work with consumers and help them purchase items and enjoy experiences they value. Others, such as police officers, firefighters, and other health and safety services, have a completely different goal in mind. The key skill universal to most service jobs is communication and the ability to work with a variety of people. Skilled trades are the backbone of many of the things we enjoy in daily life. From building the bridge you drive over every day to making your TV set or getting it to your local store, the men and women in these fields are essential to modern life. Many of these positions require on-the-job training or some degree of technical education in order to learn the specific skill set required on the job. It's time to get technical, and the job titles in these industries can get very technical and complex. The majority of these positions require a four-year degree or more and are among the highest paying careers. Your first few jobs are important for experience, and you can use these to build your resume. Over time, you may be able to drop them from your list, but for now, they show your work ethic and that is important to potential employers. These job titles have either very specific or very universal purposes and really don't fit into any of the other categories. Within each segment is a variety of individual positions that provide services, entertain, are technical, or have some other outstanding quality.